Most are available in rounded (which are safer) or pointed blades (which are sharper). Safety catches or a blade guard for protection when not in use. Check these are not too fiddly to use. 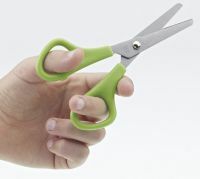 Ambidextrous scissors can be used in either hand. Table top scissors have a small plastic stand (with a slip resistant base), to use them you just push down, depressing the handle. This can be useful particularly if you have tremor or difficulty with fine movements. Many table top scissors can be changed from handheld to table top use as the scissors slide in / out of the base. 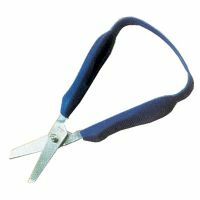 Large and/or soft touch handled scissors may facilitate grip, may be useful for people with sensitive skin or fingers and generally tend to be more comfortable to use. 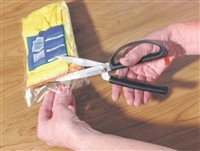 Long loop or extended loop scissors give increased strength and control over the cutting action. They allow the strength of the middle, ring and little finger to be used. 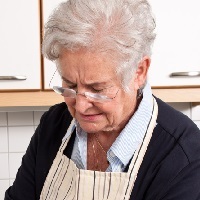 The index finger guides the cutting action and can be useful for people with tremor or reduced grip. They may be self-opening and are usually designated for right or left handed use. Self-opening scissors have a spring fitted which automatically reopens the scissors after each cut or when pressure is released. They are often combined with other features such as an easy grip or extended loop. Scissors can be operated with the whole hand, not just the fingers, making them a possible choice for if you have a thumb injury or reduced grip. 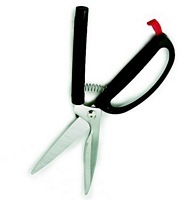 For more information view our advice on Choosing scissors.